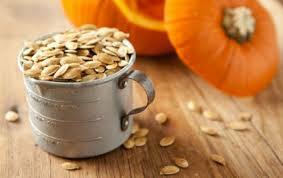 Cut pumpkin open, scoop out seeds, and then rinse the seeds. In a small pot, add the seeds to water, about 2 cups of water to every half cup of seeds. Add a tablespoon of salt for every cup of water. Bring to boil. Let simmer for 10 minutes. Remove from heat and drain. Spread about 1 tablespoons olive oil over bottom of a roasting pan. Spread the seeds out over it, all in one layer. Bake on the top rack for 20 minutes or until browned. Yes, sign me up to receive the latest family health news from Dr. Patricia.